In his first major interview last night, President Obama made an appeal to the Muslim world writ large to give his administration an opportunity to rebuild trust with America. He spoke -- eloquently as usually -- of the common "hopes and dreams" shared by people of all faiths. Obama hopes to use this thread to begin weaving a better relationship with the Islamic world through "respect and partnership". Here's a transcript of the interview. "But ultimately, people are going to judge me not by my words but by my actions and my administration's actions. And I think that what you will see over the next several years is that I'm not going to agree with everything that some Muslim leader may say... but I think that what you'll see is somebody who is listening, who is respectful, and who is trying to promote the interests not just of the United States, but also ordinary people who right now are suffering from poverty and a lack of opportunity." Unfortunately, Obama may be eating his commitment early on. Last Friday, US military drones made another incursion into Pakistan near the Afghan border. Missiles were purportedly fired from the unmanned aircraft in two strikes at Al-Qaeda and militant targets in Waziristan, which is currently controlled by the Taliban. Together, the two strikes killed between 17-22 people, about half of which were civilians -- and three were children. These strikes are a continuation of a secret authorization by President Bush in July 2007 to fight militants in the loosely-controlled tribal regions of Pakistan. This policy must be halted now. For the moment, put aside the fact that almost every one of the 30 strikes in the past 7 months has killed innocent people and children. From a pragmatic perspective, these air raids are undermining the US's goals. Although local civilians usually abhor the Taliban's rule and the violence of militants, every time a civilian is killed -- especially a child -- the Pakistani public is outraged. This tears down support for current and future US policies amongst the Pakistani and Islamic world, and it loses support for the already-struggling government of Pakistan. When these American incursions continue unabated by current politicians in Pakistan, then those politicians -- the people who are willing to cooperate with the US -- lose support. In situations like this, people tend to look for security. Don't be surprised to see a more hardline, anti-US government take the reigns in Pakistan if the civilian deaths continue. And if this happens, the US mission to bring stability to Afghanistan becomes immeasurably more difficult (as if it wasn't already in bad shape). Moreover, a less stable Pakistan threatens to bring the entire South Asian region into conflict (recall the terror in Mumbai); the US can hardly manage to put that vase back together after it's broken. These attacks into Pakistan erode Obama's (and America's) moral authority. Granted, the new president has done much in his first week to repeal the damage to American principles -- begun closing Guantanamo, restoring habeas corpus, halting wire-tapping, conforming CIA interrogation with law. Indeed, his interview yesterday was meant to began mending deep wounds to American soft power. Obama wisely pointed out that he will be judged on his actions, not his words. He made an explicit commitment to listen and show respect to Muslims around the world. Yet as Pakistanis plead for innocent deaths to abate, Obama remains silent. Less he wants to discredit himself in the first 14 days of his presidency, Obama should halt the drone attacks in Pakistan immediately. Amidst the deafening silence of two million people, listening to the 44th president's artfully delivered speech, I lost track of my painfully numb toes and fingers. There is something beautiful in the grand masses of peaceful, positive people gathering around a common identity. Maybe it is the scarcity of the occasion. Not only does one rarely see such numeric splendor with the eyes, but it is not often that one experiences an instant aura of history, like the one that fell upon the National Mall around noon today. Moreover, it may be only once in my lifetime that I will so tangibly feel such unity radiating from a complex, often-disagreeing people. It is notable that the Secret Service reported zero "inaugural-related arrests" by law enforcement. If anyone is controlling the weather, then they made it inordinately difficult to enjoy the long travel and waiting times associated with getting into the Mall. With windchill, it was 10-15 degrees Fahrenheit. I met my friends Ashesh and Stephanie in line to get into the ticketed "blue section" -- about 100-200 yards from the steps of the Capitol building -- around 9 AM. The lines were huge, unwieldy, and poorly managed by event staff. I will save you the frustrating details, but suffice it to say that the staff lacked a lot of coordination with the crowd during the entrance stage. At one point near the gate to get into the blue section, we were being picked up and carried by the crowd because of poor line management. Anyway, we entered the standing area for our section around 11:30 AM, just as Diane Feinstein began speaking. Although staff was noticeably lacking outside the barriers, there was plenty of security to go around in the open Mall area. But if the cold and boredom got to me outside the gates, then they were quickly forgotten inside. The momentous view melted all discomfort (at least for the next half hour). After Obama's delightful rhetoric -- expressing both poetry and principle -- we waited for another 45 minutes in the Mall to let the crowd begin to stream out before making our exit. Image below: my roommate and good friend, Ashesh, poses in front of the milling crowd. Once in the streets, though, my friends and I were again reminded of the intensity of the occasion. Every street for miles in any direction was packed with people. And all of them were heading in seemingly disparate directions. Surely many were headed to the Metro (the city's subway system), but others were figuring out how to burn time before their buses (which lined every street) departed the city. 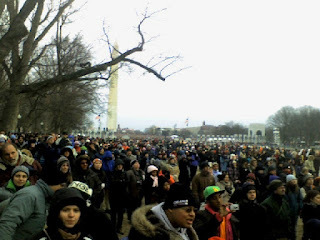 Many were also figuring out how to make their way to the parade, all the way on the northern side of the Mall. After warming up and filling up, Steph, Ashesh, and I decided to skip the incredibly long lines (hours of lines) at every Metro station and take the 2-3 mile walk all the way across and through the Mall to the Key Bridge, which leads back into Virginia. Along the way, we saw the media booths of MSNBC and ABC. We also witnessed the surreal amount of open space in the Mall that had been full to the brim a short time before. Before leaving the Mall grounds, Steph and I captured one more photo in front of the Washington Monument. Though we were tired of walking and standing, though the day was frigid, we were happy (evidently). 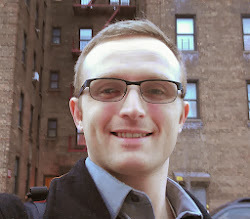 When I arrived back at my cozy apartment in Arlington (around 5:30 PM), I was floating in the excitement of the day. I lay back in my recliner and rested my feet, pondering the experience. DC had been transformed, almost bursting from the strain of millions. Yet it was a pleasant overcrowding, and it was hard to find a person who complained. The dominant feeling was one of camaraderie and shared identity. We could finally celebrate an ethnically and politically historic moment, sharing hope and anticipation. But that anticipation also breeds expectation. Needless to say, after the parades, pomp, and pageants, President Obama -- after months of waiting, it feels good to say that -- needs to be in top gear tomorrow morning. For today, though, I am taking a rare moment to indulge in the gravity of a grand social movement. It felt good to be part of today's mass gathering. And I am fortunate. Fortunate for the marvelous view. One of the benefits of living in DC is the relative ease of attending historical (hopefully, eventually) events. Today, my friends and I braved 30 degree weather and a crowd of hundreds of thousands to see some notable entertainers sing, dance, and speak. 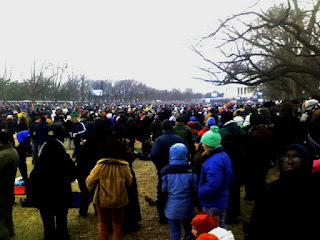 A few people had heard that there were around 1 million people packed into the western side of the Washington Mall, but it is hard to tell for sure. Suffice it to say that there were plenty of people, and when I retell the story in coming years, there will have been over a million. Here's the NYT overview of the event. The process of getting into the Mall (lines, security, etc.) was really not all that bad. There were many entry points and things moved quickly. We began on the south side but quickly discovered that the view was better from the north. Once on the north side, my friend, Julia, and I tried to scout up ahead to determine how close our group could get to the stage. It was a bad idea. By the time we reached the front third of the Reflection Pool, it became so crowded that Julia and I were being pushed along in an unchosen direction by the crowd. So we turned and made our way back to the group. 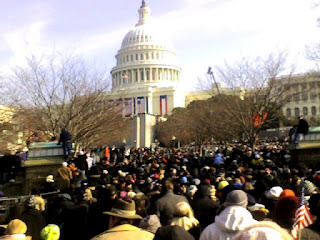 My dad had mentioned -- wisely -- that it would probably be a hassle to go to the bathroom in such a crowd, yet porta-potties were also in broad attendance -- hundreds of them lined the outer rim of the Mall. The entertainment was satisfying. I especially liked Mary J. Blige's rendition of "Lean on Me" and Garth Brooks audience revving version of "Shout". Perhaps I liked these the most because these songs increased the already high level of unity among the people in attendance. Jamie Foxx also did a superb impression of Obama; Saturday Night Live should offer him a contract for the next four years (with the opportunity for renewal after the first four). But do not be fooled, whether or not Bono was performing at this concert, the people were here for a primary reason -- because so was Barack Obama. The crowd cheered loudly for Stevie Wonder's "Higher Ground", but whenever the camera quickly panned to Obama -- usually smiling, clapping, or dancing in his seat -- the crowd noise would increase noticeably. And when Obama approached the podium to make a short speech at the end, you could have heard the ice crack on the frozen Reflection Pool. Enamoring still dominates when Obama talks. So what was my final impression of this massive get-together? Good music, fun atmosphere. The speeches and music were centered around a common purpose -- the individual and collective ability to positively change the nation. Almost every speech -- from Denzel Washington, Jack Black, Tom Hanks, Samuel L. Jackson, and many others -- was focused on lessons drawn from other difficult moments in America's history and the constructive way in which Americans reacted. It was an event of epic proportions. Yet oddly (or scarily) enough, this was a warm-up. The inauguration (to which I am fortunate enough to have a ticket in the front section) will dwarf this. 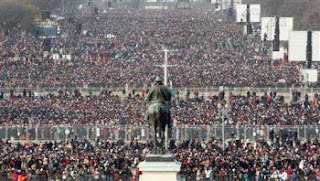 Let's hope that the coals of the social movement being stoked in the Washington Mall this week reach far and deeply beyond the borders of the capital. Nicholas Kristof made an interesting argument for more sweatshops in today's International Herald Tribune. Interesting... but flawed. His argument was basically this: in America, we may despise the idea of working in a sweatshop, but a person who is desperately poor prefers a hot factory and long hours to starving in a slum. Given this, Kristof says that well-intentioned demands by the (soon to be) Obama Administration for stricter labor standards in free trade agreements (e.g. the US-Columbia free trade agreement) are really hindering development in struggling countries and depriving the poorest in the world of opportunity to lift themselves out of poverty. If a company has to meet high standards in one country, then they'll simply go to the neighboring country that does not have the standards. Fair enough. Opportunities for employment are relative depending on where you stand. Just as Nicholas admits that he would not want a job in a sweatshop, neither would I. But just because desperation would drive some in Cambodia to view a sweatshop as an "improvement", this does not mean that we --who consume cheap products -- must accept their working in quasi-slavery conditions. There is a grey area between ultra-strict labor standards -- like providing full health care, paying far above market price for labor, and short work days -- and no labor rights. Things are relative, but there is also a baseline that we must establish as human beings. The International Labor Organization, which is sensitive to labor relativity everywhere, espouses four widely ratified fundamental human rights: the right to collective bargaining, freedom from forced labor, freedom from discrimination, and the restriction of child labor. This is the minimal amount that we could ask. In a sweatshop, workers are regularly deprived of these simple rights. Much of modern slavery finds its home in these hell holes. The distinction here is between a "sweatshop" and a "labor-intensive factory". Both are places that few in the US or the developed world would want to work, but the latter recognizes the humanity of its workers, while the former does not. Just because we -- in the developed world -- were fortunate enough to born in the US, EU, or Japan, this does not mean that we should expect others with less luck to accept a "step up" from a garbage heap to a labor prison. This is a false choice. Free trade is good for the whole, but it need not punish individuals. The current flashpoint in Gaza has people galvanized on both sides of the debate, but there is disproportionate attention given to those who argue that Israel is perfectly justified in its continued military mission in Gaza. Along with most rational observers, I agree that a nation has a right to defend itself. But this is more complex that a black-and-white case of defense. It is not just a question of rockets being launched into Israel. This whole crisis is deeply connected to the well-being of Palestinians (and thus their willingness to support Hamas). During the ceasefire period, Israel cut off most humantiarian aid to Gaza. Jimmy Carter recently wrote an op-ed that details some of this. And here is an interesting piece by an Israeli. But the subject of this post isn't so much about the less publicized argument as it is about the fact that there are many in America who do know that this is more complex. Although they are speaking out, many media outlets do not want to give them attention. People gathered at Lafayette Square and heard from a whole range of speakers (some were rather politically incorrect, some were OK), these included Ralph Nader and former Congresswoman Cynthia McKinney. 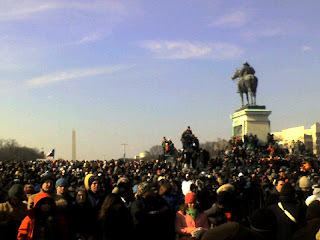 After the speeches, the march went around D.C. - the march could not get near Obama's residence (and it later turned out he was at Ben's Chili Bowl - so were probably all reporters as that became the main event of the weekend - I'm being cynical). The march blocked K street for a short bit as it made its way around D.C. and stopped at two places . One of the places was the Washington's Post headquarters , which ended up not reporting the march at all in its Sunday paper. Number of people reported varied between 10K and 20k, I say about 15k is right, but have no way of telling. I also heard there are many videos on you tube too, but I haven't seen any yet. Forget who you agree with on the conflict in Israel; this is terrible for our society. If there is a legitimate perspective that many people in the country hold, then it is the job of the press to report it. If someone in America were to watch evening news programs, then they may be conivinced that America is unified on its support of every action that Israel takes. But just as in the case of Gaza itself, the reality is more complex. Anyway, this week, Brooks gave compelling evidence to suggest why Obama may be overconfident in his ability to time and allocate the recovery spending correctly. He thinks Obama is taking on too much -- promising to forward every policy goal without focusing on any one thing. In addition, the bill is going to be ultra-complex in written form, which poses problems for getting it passed through a Congress of 435 seperate interests. On the other hand, Krugman (and others like John Judis) reveals doubt over the recovery package for exactly the opposite reasons. "The economic plan he’s offering isn’t as strong as his language about the economic threat. In fact, it falls well short of what’s needed." According to this analyst, Obama's $775 billion plan will not cover the projected $2.1 trillion loss in production. Even worse, only 60% of the plan is public spending; the rest is tax cuts, which isn't as likely to cover the gap in production. The result could be an underachieving plan that prevents a deeper economic crisis. These two essays, taken together, present severe pessimism for this plan. One perspective thinks expectations are too high. The other predominant view says the bar is set too low. But even if the economic plan can get past obstacle #1 (it passes Congress without much delay and is implemented without mistakes), then the package faces the daunting reality that it may only be half the size it needed to be in order to save the US from a deeper recession. The reality is that there is almost widespread consensus among economists (a rare moment in history) that a large spending plan is needed to fend off the next Depression. So as reasoned as Brooks' argument for political expectations is, an unprecedented spending bill is coming through the Congress. Brooks' concerns -- insofar as solutions to the problem go -- are irrelevant. Therefore, only the "underperformance" concern remains, and the solution becomes clear. Obama must step up spending significantly. Double his plan's size or more -- $1.5-$2 trillion would be the in the ballpark. And if such big numbers make you nervous, just remember that the Great Depression was just a recession at first -- until FDR failed to spend enough. In China, labor unrest has reached levels unwitnessed in the past decade, and even state-run news publications are forecasting a very difficult 2009. This is all much different than the early predictions last Autumn that China's economy was "decoupled" from the global crisis -- China was thought to escape relatively unscathed. Even I thought as much up until October, when the unemployment numbers really took a turn for the worse in the export hubs of the coastal cities. In December, the IMF and various economists predicted 5% growth for China's GDP in 2009. An article written today by Chinese observer John Pomfret asks an important question, "Is the worsening economic climate in China going to have severe social consequences?" The stories of massive worker layoffs have piled up. In dire economic circumstances, there is always a possibility that a tipping point could be reached and the employment could overwhelm a government's ability to handle it. "The prevailing narrative about China in the United States is that the Communist Party is secure in power and that while the economic downturn will cause trouble, the party will probably muddle through... [However,] China is not the United States and... its political system is inherently unstable." Pomfret is claiming that the protests are really about Chinese people's dissatisfaction with their political system. He is wrong. The unrest is comprised of thousands of people outside of their (shutdown) factories and places of employment demanding backpay or protesting their termination without fair warning. The same thing would happen in the US if employers began laying off workers without pay or warning. (In fact, this did happen on a smaller scale in Chicago in November.) The political system is irrelevant in the minds of these protesters. They have little or no money and do not know where they will go next -- wouldn't you feel wronged as well? However, this does not alter the reality that China's social stability may still be at risk. Not because it is a one-party state but because it has hundreds of millions of workers. Every labor problem that other nations (save India) must deal with during this global recession is magnified in China. The US has "massive layoffs" of 30,000 workers; China closed up to 60,000 factories in 2008 alone. The magnitude of unrest -- along with most everything else -- is far greater in China. So what should the Chinese Communist Party (CCP) do? They've announced and began implementing a $586 billion stimulus package. Unfortunately, the labor unrest is rooted in something that cannot be fixed in the short-term with an injection of money: a massive export sector. To be sure, China's growth is primarily led by domestic spending, not exports. But between 20-30% of China's GDP is still coming from its export sector. That is a significant portion of the economy still sensitive to the ebb and flow of the global markets. Hence, a global recession begets massive unemployment. The real solution to avoiding labor unrest lies in a Chinese economy composed of workers insusceptible to export shifts. In the long-term, the CCP is aiming toward an economy driven by more domestic consumption. Its next five-year plan is focused on tapping into the productive and consumptive powers of the 800 million poor, rural Chinese. They envision a gigantic middle class fueling the next century of China's economic rise. "This new game isn’t a war of attrition. It’s a struggle for confidence, a series of psychological exchanges designed to shift the balance of morale. The material destroyed in an episode can be replaced, but the psychological effects are more lasting. What is really important is how each episode ends, because the ending defines the meaning — who mastered events and who was mastered by them." He has made out the violent exchanges between Israel and Hamas to be -- most importantly -- a "psychological game." He says the violence only destroys the "material" that "can be replaced" and which is not long-lasting. How can 150 innocent lives -- extinguished in this "game" -- be regarded so heartlessly? To talk about this conflict like nothing more than a chess game is to dehumanize those people that are being used as ivory pawns. Even when he mentions that the "suffering of the innocents in Gaza magnifies" the psychological "reverberations," he is only mentioning the lives of these people in terms of their importance to the game. The suffering itself is irrelevant to him. As Brooks himself says to close the essay, "psychology matters most." No, Mr. Brooks, these are real lives. His article is shameful. George Will's recent op-ed is a love-hate essay for me. On the one hand, Will convincingly points out that if not for a 1971 Supreme Court decision, then many more jobs would be available to high school graduates based on the merit of employee examinations. People *should* be hired on knowledge and ability to do the job. The illegality of these tests -- due to discrimination -- has also caused the "measure" for hiring to be a college degree, which in-and-of itself is rather arbitrary. Furthermore, this requirement has put better jobs out of reach for many, many people who cannot afford to shoulder college expenses (especially as tuition costs have risen). On the other hand, although I see the logic in that argument -- and agree with it -- I have a hard time agreeing with one of the implications: "Motivating more people to get a college degree is bad." There has been an explosion in Americans attending college -- in part due to the necessity for obtaining a job. And this makes for a more informed, healthier -- college graduates live longer and are happier on average -- population. A solution to reconcile this tension: make college affordable! Paul Krugman's NYT essay argues that the Republican party has primarily been led by and founded on racism. That's a deeply serious accusation. Krugman needs more evidence to make such a claim. Certainly, racism has been more prevalent in the GOP. But Krugman is claiming that the conservative message of "anti-government" is really a proxy for anti-black. That's a stretch. And possibly a direct insult to the numerous black members of the Republican party. The poem below inspired the original title of my blog, "Peace, My Soul". (The title was changed in 2015.) Although the poem was written, in part, in the Christmas spirit, its resonance is far more broad for me. And Angelou meant it to be larger than the holiday season. It is a celebration of our common humanity. That shared humanness creates an imperative to treat others as such, driven by the spirit of peace. Angelou writes the poem to be inclusive of every person, regardless of their metaphysical convictions. Her poetry first sweetly persuades then powerfully demands us to look past marginal differences and summon the peace that resides in each of us. The last three lines have special meaning for me, though. If there is ever a dogma that is close to infallible, then it is those lines. "Peace, My Brother./Peace, My Sister. ": approach others wanting happiness for them; work to help them find peace. "Peace, My Soul. ": before you can truly share peace, then you must first genuinely find it in yourself. This is important to me. When my tolerance is tried by hate, its actions, or its horrors, then I must remember that true peace will never follow down the road of hate. Peace, my soul.